Harcourts was thrilled to announce in October 2015 that Apple Inc had chosen Harcourts International, and our industry-leading suite of apps to be profiled and showcased across its global web network. Harcourts is the first originally New Zealand based, global company, and first international real estate business to receive this recognition from Apple, with the accolade reserved only for organisations across the globe who are adapting iOS devices in the most cutting edge way to deliver greater efficiency and productivity. An important part of any real estate agent’s role is to help property sellers build an effective, customised property marketing plan to maximise the sale price. Harcourts agents previously fulfilled this task by trawling through ‘look books’, brochures and marketing material. Many other moving parts were involved in defining and activating these plans, which Harcourts has now beautifully packaged into its eCampaign iPad app. 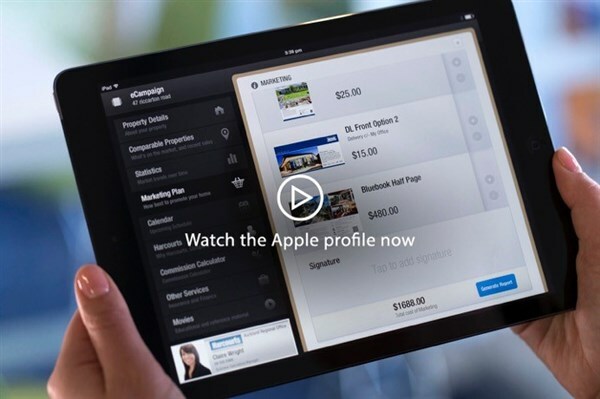 The app allows agents to present, build, quote, approve and take action on a property marketing plan — all on iPad. With the help of an integrated API, Harcourts also feeds in real-time hyper-local property information — such as recent sales in various areas — to help sellers and buyers make educated decisions about property sales and purchases. Before iPhone and iPad, keeping track of all the paper-based information Harcourts agents needed on the go was tricky. Now, the Harcourts eOne app for iPad and iPhone streamlines fundamental property processes by giving consultants remote access to local area sales data and a full view of their customer data — including all previous interactions. The iPad version even allows consultants to capture leads for potential buyers during an open house, then email a report to the seller.